For turning pages, opening doors and brushing teeth. Patients with spinal cord injuries, according to assistive technology company Neofect, face three major challenges navigating their day to day lives: opening and closing doors, brushing their teeth and picking up objects like a glass of water. 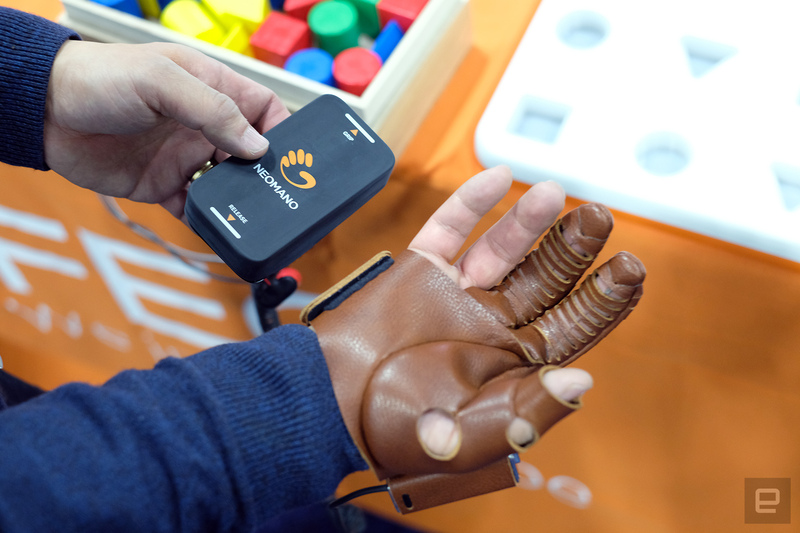 For those who may be wheelchair bound with limited use of their hands, Neofect has developed a robotic glove that wraps around the palm as well as index and middle fingers. Called NeoMano ("new hand" in a Latin/Spanish amalgamation), the glove connects to a rubber pad that can be controlled with an elbow or arm to activate grip and release motions. The mechanism itself is straightforward: Two wires run down the length of each finger and triggering the grip reels them in, allowing users to pick up objects as heavy as about 1kg. Neofect says the lightweight glove is designed to be worn every day. Founded in 2010, the company previously made the Rapael Smart Glove to assist hand-eye coordination in stroke rehabilitation. The prototype NeoMano we saw at CES will look "cooler" in future according to a spokesman, who also said they plan to add voice recognition and head motion to activate it. The glove should launch on Kickstarter toward the end of the year for less than $1,000.